Southside Place is a city in west central Harris County, Texas, United States. The population was 1,715 at the 2010 census. As of the 2000 census, Southside Place was the 13th wealthiest location in Texas by per capita income. It has since dropped to the 14th wealthiest location. Southside Place functions as a bedroom community for upper-middle- and upper-class families. Many businesses are located in Southside Place; all are along Bellaire Boulevard. The United States Postal Service uses "Houston" for all Southside Place addresses; "Southside Place, TX" is not an acceptable postal city name for mail addressed to locations in the city. Southside Place opened on Easter Day in 1925. Edlo L. Crain, the developer, placed a pool and a park in a subdivision to attract residents to the townsite. The first section to open was south of the park. It was in close proximity to Bellaire Boulevard and the streetcar line, which was nicknamed the "Toonerville Trolley". In 1926, development of the second section of Southside Place, which spanned from Harper Street to University Boulevard, began. The Great Depression slowed development. The site of Southside Place previously housed the Harris County Poor Farm. The Haden and Austin company had purchased the poor farm and, after a period, sold it to the E. L. Crain and Company. 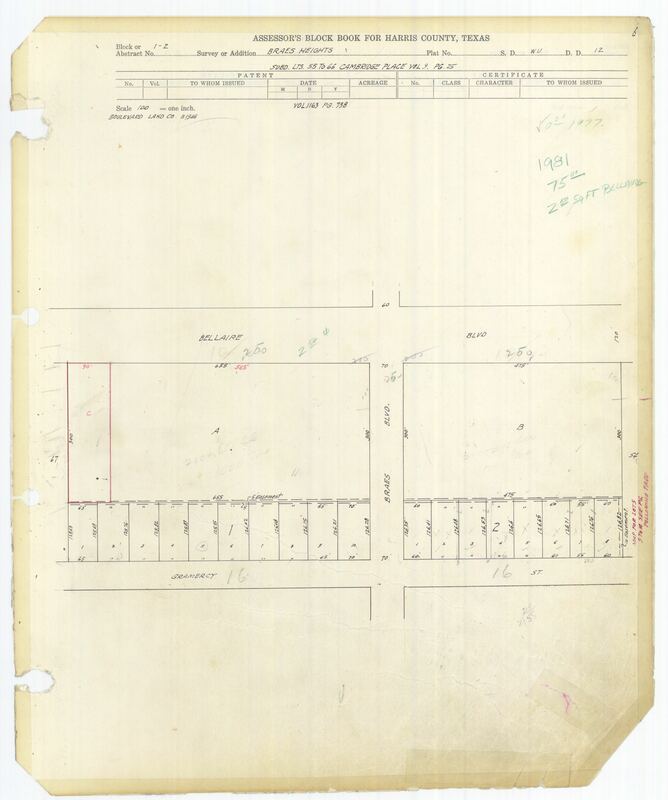 Southside Place incorporated in June 1931 with 600 residents. The city council first met on June 15 of that year. On August 3, 1934 the city council passed a resolution that declared Southside Place an incorporated city. Because of the incorporation, Houston did not incorporate Southside Place's territory into its city limits, while Houston annexed surrounding areas that were unincorporated. A post office opened in 1940. Before World War II the population stabilized around 1,400. In the 1960s the city reached a high 1,500 residents. By 1979 the number of residents fell to 1,263. In 1988 the city had 1,560 residents. In 1990 the city had 1,384 residents. In early 2009 Southside Place announced that it would demolish its previous municipal buildings and build a new multi-story municipal complex. Southside Place is located at 29°42′35″N 95°26′8″W﻿ / ﻿29.70972°N 95.43556°W﻿ / 29.70972; -95.43556 (29.709629, -95.435442). According to the United States Census Bureau, the city has a total area of 0.2 square miles (0.6 km²), all of it land. The city is surrounded by the cities of Bellaire, Houston, and West University Place. The Blair House, a two story, red-brick, 183-unit apartment complex, opened in 1963 and was on a 4.2-acre (1.7 ha) site. As the value of land rose in Southside Place, pressure came to redevelop the land. The complex close on September 11, 2015 and was bulldozed in November of that year. Trammell Crow Residential built the four-story, 269-unit Alexan Southside Place in its place. A portion of Braeswood Place, Blocks 1 and 2 of Braes Heights Section 1, is in Southside Place. The rest is in the City of Houston. As of the census of 2000, there were 1,546 people, 618 households, and 370 families residing in the city. The population density was 6,270.9 people per square mile (2,387.7/km²). There were 647 housing units at an average density of 2,624.4/sq mi (999.2/km²). The racial makeup of the city was 91.72% White, 1.03% African American, 4.14% Asian, 1.81% from other races, and 1.29% from two or more races. Hispanic or Latino of any race were 6.47% of the population. There were 618 households out of which 40.9% had children under the age of 18 living with them, 53.2% were married couples living together, 5.5% had a female householder with no husband present, and 40.1% were non-families. 38.5% of all households were made up of individuals and 18.3% had someone living alone who was 65 years of age or older. The average household size was 2.50 and the average family size was 3.44. In the city, the population was spread out with 33.2% under the age of 18, 3.2% from 18 to 24, 26.1% from 25 to 44, 26.3% from 45 to 64, and 11.2% who were 65 years of age or older. The median age was 39 years. For every 100 females, there were 91.3 males. For every 100 females age 18 and over, there were 82.7 males. The median income for a household in the city was $81,267, and the median income for a family was $163,303. Males had a median income of $100,000 versus $48,654 for females. The per capita income for the city was $57,021. About 3.3% of families and 5.3% of the population were below the poverty line, including 2.7% of those under age 18 and 12.7% of those age 65 or over. Southside Place's city council meets on the second Tuesday of each month. The mayor and the city council are elected for two-year terms. Two and three vacancies are on the council on alternate years. Elections are held during the first Saturday in each May. Any qualified voter may be placed on the ballot for Mayor or a city council position. The Mayor and each council member receive a one U.S. dollar per year salary in accordance with a Texas state law which requires all city officials to receive a salary. As of 2016 the mayor is Glenn "Pat" Patterson. Richard Rothfelder preceded him. Melissa Byers, Jennifer Anderson, Dr. Melissa Knop, Douglas Corbett and Andy Chan are the city council members. The Southside Place Police Department is a 24-hour police organization that provides police services to the City of Southside Place. The Chief of Police is Don H. McCall and employs 9 sworn Texas Peace Officers. The Southside Place Police and Fire Departments are headquartered along with the city administration at 6309 Edloe Avenue. The Fire Department is a two engine company house. All of its members are volunteers. The Fire Chief is Ulysses Serrano. It has a mutual aid agreement with the cities of West University Place and Bellaire. Southside Place is in Harris County Precinct 3. As of 2018, Steve Radack serves as the commissioner of the precincts. Southside Place is located in District 134 of the Texas House of Representatives. As of 2018 Sarah Davis represents the district. Southside Place is within District 17 of the Texas Senate. Southside Place is in Texas's 7th congressional district; as of 2019 Lizzie Fletcher is the representative. The Braes Heights Shopping Center, a two story mid-century modern shopping center, is located in Southside Place. In 2012 the Houston Press ranked the center the "Best Strip Mall - 2012" due to its abundance of small businesses that made the editors feel nostalgic. The editors said "In many ways, Braes Heights seems more like Rice Village than Rice Village" because many iconic small businesses had left Rice Village by 2012. Shell Oil Company's Bellaire Technology Center had been located in Southside Place. The 310,000-square-foot (29,000 m2) facility opened as a geophysical processing center in 1936. For decades many scientists and engineers discovered and studied facts related to oil and natural gas. In 2008 Shell announced that it would close the Bellaire facility and expand the Westhollow Technology Center in Houston to accommodate the most of the staff employed by the Bellaire center, while some staff would go to the Woodcreek Technology Campus in western Houston. Shell said that it closed the Bellaire facility partly because two thirds of the land was leased, and the lease was set to expire in 2010. The move decreased tax revenue into the City of Southside Place; the city rezoned the parcel for various land uses. The Palace Bowling Lanes bowling alley, a two-story, 80,000-square-foot (7,400 m2) structure that was built in 1955, was on a 2.8-acre (1.1 ha) plot of land in Southside Place. In October 2016 the owners sold the alley, which had been renamed Bowl on Bellaire but still had signage reading "Palace Bowling Lanes", to Sparkle Frame, and that group closed the business later that month. In September 2018 the real estate firm Triple Crown Investments stated that it would remodel the building into the Southside Commons complex, and Arch-Con Construction will be the construction company. A bowling alley, restaurants, 10,000 square feet (930 m2) of retail space, and other entertainment facilities will be on the first floor; the restaurant and entertainment businesses would take up a total of 30,000 square feet (2,800 m2) of space. Offices, including medical and non-medical purposes, occupying 40,000 square feet (3,700 m2) are to go on the second floor. The building is scheduled to re-open around Summer 2019. Southside Place is a member city of the Metropolitan Transit Authority of Harris County, Texas (METRO). The city is served by bus lines 2 (Bellaire), 68 (Brays Bayou Crosstown), and 73 (Bellfort Crosstown). The city is served by Houston Independent School District. The community is within Trustee District V.
Pupils who live in Southside Place north of Bellaire Boulevard are zoned to West University Elementary School in West University Place, and people who live in Southside Place south of Bellaire Boulevard are zoned to Mark Twain Elementary School in the Braeswood Place neighborhood of Houston. All Southside Place pupils are zoned to Pershing Middle School in Braeswood Place in Houston; any student zoned to Pershing may apply to Pin Oak Middle School (in Bellaire)'s regular program. Pupils in Southside Place who are west of Stella Link and south of Bellaire Boulevard are zoned to Bellaire High School in Bellaire, while all other pupils in Southside Place are zoned to Mirabeau B. Lamar High School (in Upper Kirby), also in Houston. Gabriela Mistral Early Childhood Center is the closest early childhood center to the city of Southside Place. Since only poor students, homeless students, students who are not proficient in English, or children of active-duty members of the U.S. military or whose parent has been killed, injured, or missing in action while on active duty may be enrolled tuition-free in HISD preschools, most Southside Place residents rely on private preschools. Students who are eligible for HISD's preschools may attend any Early Childhood Center in Houston ISD. Southside Place is served by the Houston Community College System. Southside Place is near three public libraries. Harris County Public Library system operates a branch in West University Place. The Houston Public Library system operates the McGovern-Stella Link Branch in Braeswood Place and in Houston. The city of Bellaire also operates its own library. The park and pool facilities are operated by the Southside Place Park Association, which is not affiliated with the City of Southside Place. The SPPA is governed by a seven-member Board of Directors and managed by two paid employees. The park/pool area is located between Auden and Edloe on the streets of Garnet and Farbar. Facilities include a park, tennis courts, baseball field, basketball court, swimming pool and clubhouse. Only the park, field and basketball court are open for public use. Use of the tennis court, pool and clubhouse require a park membership. Annual membership is $425 and is open to residents of Southside Place. Approx. 80% of Southside Place residents are also park members. The clubhouse is home to a summer camp that is run by the Parks Department. The park staff consists of 1 full-time Parks/Recreation Director, 1 part-time clubhouse manager, 30+ camp staff members, 2 assistant pool managers, 2 swim lessons instructors and 35 Red Cross certified Life Guards. The pool is also home to a 150+ member swim team that competes with other pools in the Houston area. Swim team season runs from mid-May through the end of June. The Houston Chronicle is the area regional newspaper. On Thursdays, residents receive the Bellaire/West U/River Oaks/Meyerland  local section. The West University Examiner is a local newspaper distributed in the community . The Village News and Southwest News is a local newspaper distributed in the community. The city government publishes Southside Place Today, a community newsletter that is included with resident water bills. In the mid-20th century the community newspaper Southwestern Times served Southside Place and surrounding communities. The paper was headquartered in Rice Village, and it served as an official publication for the city. ^ "Profile of General Population and Housing Characteristics: 2010 Demographic Profile Data (DP-1): Southside Place city, Texas". U.S. Census Bureau, American Factfinder. Retrieved June 26, 2012. ^ a b "The History of Southside Place." City of Southside Place. Retrieved on July 6, 2011. ^ Lee, Renée C. "Annexed Kingwood split on effects." Houston Chronicle. Sunday October 8, 2006. A21. Retrieved on July 6, 2011. "Some of the area communities that incorporated as cities and escaped annexation by Houston:" Print version exclusively has the information cited; the information is not included in the online edition. ^ "Architects and Town Center Committee Update." City of Southside Place. July 1, 2008. ^ "RIP: The Blair House, 1963-2015". Houston Chronicle. 2015-11-04. Retrieved 2018-09-11. ^ Braes Heights Section 1 Blocks 1-2 (JPG). Harris County. Retrieved on March 24, 2019. ^ a b "Southside Place city, TX." U.S. Census Bureau. Retrieved on March 24, 2019. ^ "." City of Southside Place. Retrieved on August 8, 2016. ^ "." INTERLOCAL COOPERATION CONTRACT BETWEEN THE CITY OF SOUTHSIDE PLACE AND THE CITY OF WEST UNIVERSITY PLACE. Retrieved on April 23, 2015. ^ "Precinct Maps : All Precincts." Harris County, Texas. Retrieved on December 13, 2008. ^ "Welcome to the Harris County Precinct One Website!." Harris County, Texas. Retrieved on December 13, 2008. ^ "House District 134." Texas House of Representatives. Accessed October 11, 2008. ^ "Senate District 17" Map. Senate of Texas. Retrieved September 28, 2008. ^ "Congressional District 7." National Atlas of the United States. Retrieved on November 21, 2008. ^ a b "Braes Heights Shopping Center." Houston Press. Retrieved on October 13, 2012. "Braes Heights Shopping Center 3800 Bellaire Blvd. Houston, TX"
^ "DC10BLK_P4869272_001.pdf." (Archive) U.S. Census Bureau. Retrieved on October 13, 2012. ^ Hays, Kristen. "ENERGY / Shell outgrows Bellaire hub / West Houston campus to expand to replace old research center." (Alternate link) Houston Chronicle. Wednesday July 2, 2008. Business 1. Retrieved on December 13, 2008. ^ "Research centres." Royal Dutch Shell. Retrieved on January 14, 2009. ^ Perin, Monica and Jennifer Dawson. "Shell move to put choice land up for grabs." Houston Business Journal. Friday July 4, 2008. Retrieved on December 13, 2008. ^ a b Feser, Katherine (2018-09-10). "Palace Bowling Lanes to be revived as Southside Commons mixed-use development". Houston Chronicle. Retrieved 2018-09-11. ^ Feser, Katherine (2016-10-26). "Palace Bowling Lanes on Bellaire closes". Houston Chronicle. Retrieved 2018-09-11. ^ Pulsinelli, Olivia (2018-09-11). "Former Palace Bowling Lanes to be redeveloped as family entertainment venue, offices". Houston Business Journal. Retrieved 2018-09-11. ^ "System Map." Metropolitan Transit Authority of Harris County, Texas. Retrieved 23 May 2008. ^ "Uptown/Galleria and Greenway Plaza Area." Metropolitan Transit Authority of Harris County, Texas. Retrieved June 17, 2008. ^ "Schedules." Metropolitan Transit Authority of Harris County, Texas. Retrieved June 17, 2008. ^ "Trustee Districts Map." Houston Independent School District. Retrieved on November 11, 2008. ^ "Pin Oak Middle School." The Southwest District. Houston Independent School District. ^ "Early Childhood and Prekindergarten Programs." Houston Independent School District. ^ "Southside Place Today May/June 2006." (Archive) City of Southside Place. Retrieved on October 13, 2012. ^ Southwestern Times (Houston, Tex. ), Vol. 2, No. 18, Ed. 1 Thursday, January 24, 1946. Page: 1 of 16 (Page view). Posted at the Portal to Texas History, University of North Texas. Retrieved on March 2, 2017. ^ Southwestern Times (Houston, Tex. ), Vol. 4, No. 44, Ed. 1 Thursday, July 22, 1948. Page: 2 of 20 . Posted at the Portal to Texas History, University of North Texas. Retrieved on March 2, 2017. "2510 Times Boulevard, Houston 5, Texas (In The Village)"
Wikimedia Commons has media related to Southside Place, Texas. This page was last edited on 24 March 2019, at 14:59 (UTC).